I Am Momma - Hear Me Roar: Soapbox Saturday: Vinyl Crafts and a GIVEAWAY! Today we are welcoming a new sponsor - Vinyl Crafts. Vinyl Crafts sells a variety of wooden signs, wall decals, subway art, typography, and a variety of wall vinyl decor. She takes custom orders and she's giving one reader a $50 credit to her store. We Can Do Great Things Wodden Sign. I love the simplicity and the sentiment of this sign. 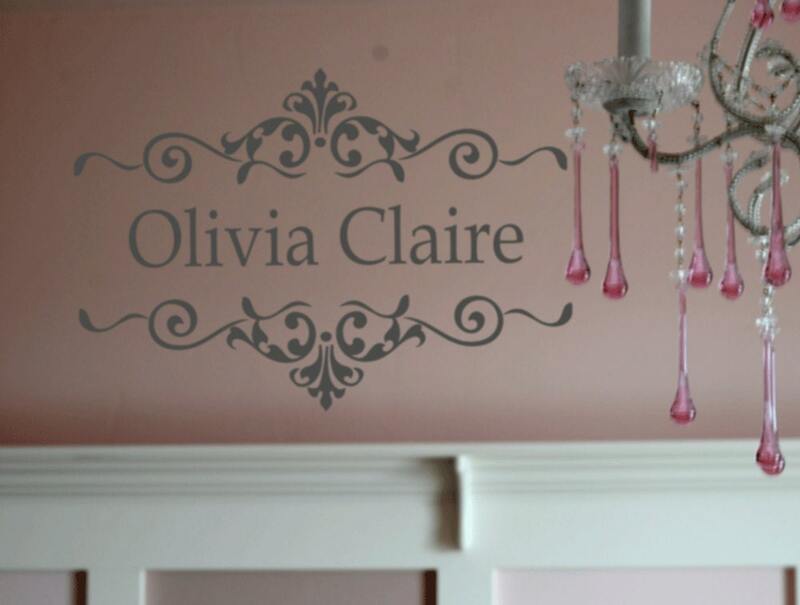 Custom Name Vinyl Decor. That's so pretty over a bed or crib. 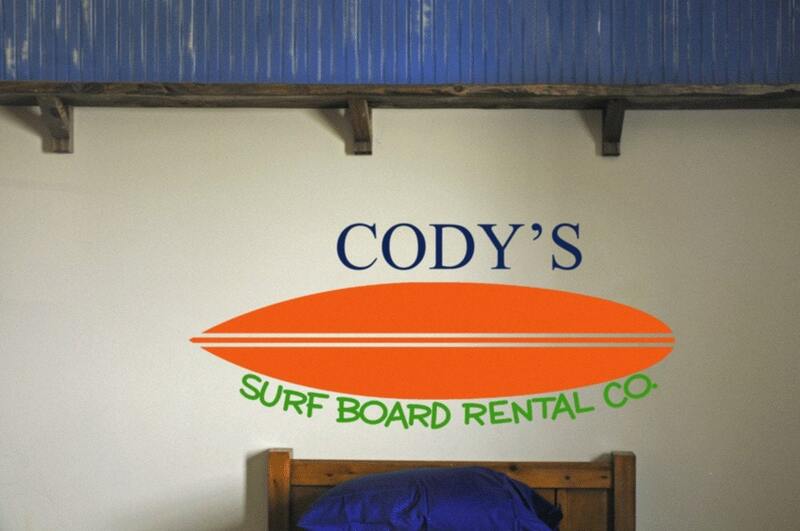 Customized Surfboard Name Decal. This one is so fun. Family Subway Art Decal. What a great display of your family. You can head over and check out all the other beautiful items in the Vinyl Crafts etsy shop right HERE. To enter the GIVEAWAY you can tell us what you like from her shop and you may enter one more time if you "like" her on facebook right HERE. (Leave one comment for each entry.) Winner will be announced Tuesday morning. I LOVE the culinary herbs subway sign. It would be perfect in my kitchen! The first thing to catch my eye was the chandelier, which is awesome!--and I usually am not a fan. I also LOVE the monogram stuff! And the Family Subway Art--so great! The Zinnias for sure!! So gorgeous! And I can choose my colours? bonus! It's a toss up! I really like the keep calm and carry on sign and the zinnia painted board. Great color choices too! I like the Subway Art Style Alphabet Sign! I love that you can have it in any color too! I love the family wall!!! Love the zinnia flower one. The Family Subway Wall Art is amazing! For that price and it is so big. It's really creative and I can totally see it in my entry way stairs. Another favorite is the laundry room. My hubs is finally finishing mine and this would be perfect. I love the monogram art! So cute for a child's room! I love the I Fell In Love Handpainted Wooden Sign. Reminds me of my husband & when we met. But all of them are very nice. so talented. I LOVE the bathroom rules sign! I love the saying we can do great things! I would love that for my girl's room. I love so many. I like the keep calm, great things. This art has become so cool and she really has great choices, not to mention custom ones. I'll head over there. Ooh I love the Zinnia Flower Silhouettes on Wood or the Chandelier Silhouette on Wood. Thanks for the giveaway! Loved the "family" vinyl with all the words- love how personalized it is! I've been trying to order a custom vinyl sign for awhile, but two separate places didn't respond to my emails. 9 kids- wow! I love the quilting & sewing subway art sign - would be perfect in my sewing room! I have had my eye on the twinkle twinkle little star board for WEEKS! I want it in darker blue with cream letters for my 2 year old son. : ) Thanks for the giveaway! I liked her on Facebook!!! Thanks so much!!! Wow there is so much to choose from! But I would have to say my favorite is the our love story board. I love the black and white chandelier. I like the family rules subway art. Thanks for the awesome giveaway! I like the bathroom rules subway art or the child's monogram - so cute! I 'liked' her shop on Facebook! I liked VinylCrafts on Facebook. I really like the surfboard wall art!! Alphabet art and flower silhouettes are my favorite. I like the creativity and I like things on signs so I can move them around. Flower Silhouettes for sure. Great idea. I love the We Can Do Great Things Wooden Sign! I love the Zinnia Flower Silhouettes. I liked vinyl crafts on FB. I love the latitude and longitude sign! Love everything, but would LOVE the family rules board. Love the "Family Established" and the names. Love the New Family Rules art and the Personalized Subway art. So nice and they make you feel happy! I "like" her on FB! I would LOVE to have the Family Subway Art or the Family Rules - both on my wish list!! I would love to have the vinyl lettering monogram for my grandsons room . So neat! Really love all of these vinyls! I really like the children's monogram vinyl. The family decal is awesome, love it! love LOVE LoVe the "Our Love Story"!!! I like the "Keep Calm and Carry On". The first one you showed is awesome as well! I love the Family Rules one! I like the family subway art. I like Vinyl Crafts on facebook. I think I'd put the money towards a custom order. Just saw a cute idea on Pinterest I'd love to recreate. I fell in love sign is breathtaking! I love the bathroom rules! My favorite is the personal love story subway art - such a sweet idea, and I can totally picture that hanging in our master bedroom! I LOVE the Twinkle little star art, and think the bathroom subway art is just too cool. Would look so funky in my oh-so-boring bathroom. I like the Family wall subway art. What a cute idea! Love the family subway art! JUst what my house needs!! I absolutely love the chandelier silhouette. Its so gorgeous. I love the Keep Calm and Carry On Handpainted Wood Sign. Gorgeous! I really like the love story, plus our wedding anniversary is this month!!! so simple, but so beautiful...it made me smile and think of my amazing husband reading it. I like this one: http://www.etsy.com/listing/76081818/meaningful-places-subway-art-handpainted I saw some towels last weekend with a similar motif, and I love that you can customize it at her shop! I love the Chandelier Silhouette on Handpainted Wooden Board. Thanks for the chance to win! Love the custom family rules subway art! 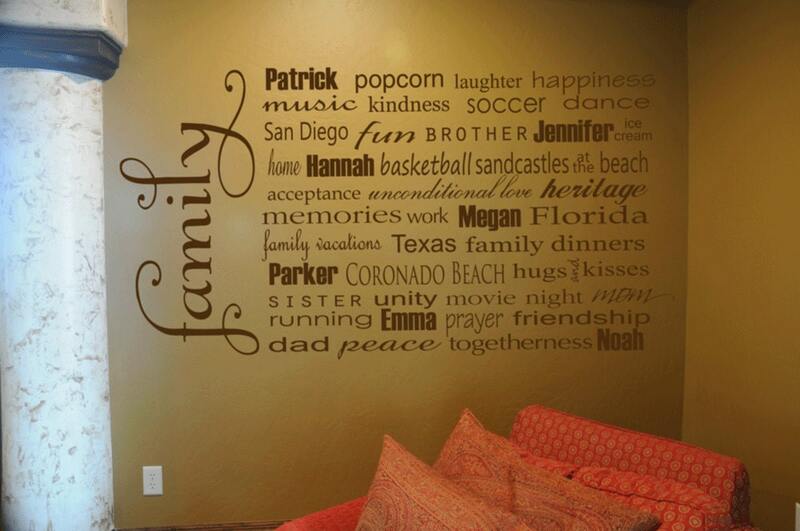 I love, love, love the Family Subway Art Vinyl Wall Decal - Customized with Your Words and have the perfect wall to put it on! I love the personal love story one and the twinkle twinkle little star... oh I love them all! I like Vinylcrafts on facebook too! I love the family subway art and the rule board. I also "like" on Facebook as Lauren Frank. I love the "Together We Can Do Great Things" sign! I LOVE the family wall and also the Laundry Subway wall art. I pinned both on my Pinterest! There are so many great ones to choose from! I would have to say my favorites are Family Rules Subway art and the Twinkle, Twinkle Little Star One! I like the Laundry Subway art!!! keep calm and zinnas. definitely! Love the Family Subway Art Decal, but Also love the Love Story Subway Art! So neat!!! I love the words that inspire sign! thanks! I'm loving the Family Subway Art where you can include the names of your family members. Love the bathroom rules! Thanks for the giveaway! I love the custom name to go over my baby's crib! im a big fan of the personalized subway art. would wk great in my son's subway nursery! I love everything!!!! I have always wanted to put some vinyl on my walls! I really like the family rules. I like the family rules subway art! I think the monograms are cool. Also i like that she does vinyl on boards so it is easy to move around. I love the Life is a Gift Horizontal Subway Art! Thansk for the giveaway! I LOVE the BYU subway art! It would be a great gift to my in-laws for their BYU Game room!! I "Like" vinylcrafts on Facebook!! I LOVE the chandelier vinyl! I really like the "together we can do great things" sign. Love. Love. Love it. 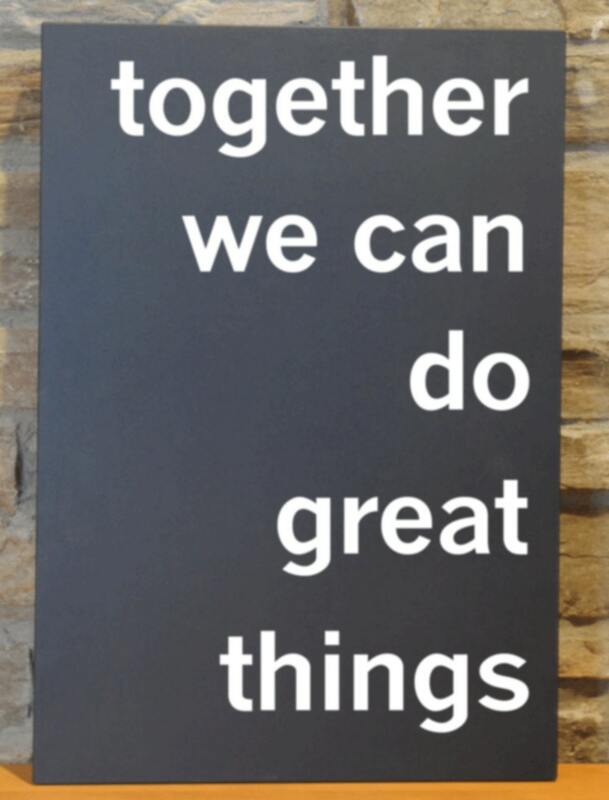 I like the 'together we can do great things sign...' I would really love one of those. Love the alphabet design for my little one! Also liked her on FB! I simply adore the "together we can do great things" - what a family mission statement and goal.I adore the charcoal grey colour too :) Also.. liked her on FB. Awesome giveaway! We just moved and I would love the Family subway art for our new foyer! Thanks for the chance! I love the "twinkle twinkle little star", sweet and simple. I love the family rules subway art. I've wanted one for a long time. Thanks for the great giveaway! I love the surfboard vinyl. We just moved to the beach and this would be perfect for my boys room! I like the custom family subway art, and the name subway art. I also "liked" her on Facebook. Thanks for the chance! SO many gooders to choose from... but I'm loving the Zinnia Flower Silhouettes and Our Love Story. Such a great giveaway... thanks! I love the Zinnia Silhouette decals. They would look great on our blank walls (we have lived in our house for almost 4 years now! ).